The Love & Courage podcast. 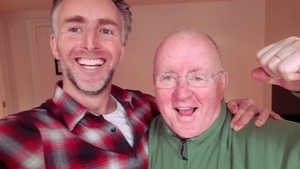 Ruairí McKiernan (top left) meets Christy Moore (right). In what may be his most honest and revealing interview yet, the folk legend has opened up about how the death of his father impacted him at an early age, about the joy he has found in sobriety, hate mail he has received, and why he feels more needs to be done when it comes to environmental action…. 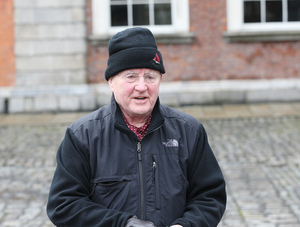 Posted in Misc and tagged Christy Moore, Ruairí McKiernan at 4:59 pm on February 19, 2019 by Bodger. 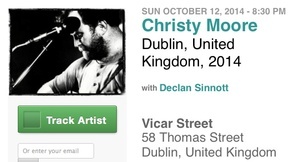 I love Christy Moore’s music. He’s an incredible storyteller. How many homes does he own and rent out to others? That is now the social division in Ireland after all. I honestly have no idea queenie. To be perfectly honest, it’s a question that has never even crossed my mind. I’ve only ever really been interested in him as a musician. I know very little about him personally. But it’s an interesting question. if it’s at a fair price I wouldn’t mind, responsible owner ? Does it exist ? I bloody love the man and his music. Back in the eighties I was a big fan of Moving Hearts, Planxty and Christy Moore. I used to go see Moving Hearts twice a week in the Baggot Inn and the Mount Merrion, they were one of the best live bands I have ever seen and Christy Moore was the heart of it. I saw him in the first concert he did after he gave up the gargle, he was shaking like a leaf (from nerves I assume)but gave a powerful performance. I’ve never met him personally but he seems like a decent bloke. Anyone now for the last few choc ices? Hard to imagine anyone going to the trouble of sending hate mail to Christy Moore, a real gentleman and a fine artist who’s work will endure. I lost the will to listen before Christy got to say a word, drone, drone drone…. Same here; over six minutes of self-promotional rambling blather culminating in a litany of the names of everyone he knows. This guy Ruairí McKiernan is some chancer. Does he want to be a millionaire socialist like Christy? His list of previous guests gives an insight in to his own personal echo chamber. It’s a luxury only the wealthy can indulge in. I’m guessing most people who declare Christy as a ‘sound man’ don’t know him or haven’t even met him..
Christy is nothing special, nothing grand. Dear Ruari, really enjoyed the interview with Christy, very special. I had the honour of meeting him in the Baggot Inn before the full formation of Moving Hearts, as far as I can remember with Donal and Declan, only three of the full band but still brilliant. I presented Christy with a song after a gig and they put it on the first album. Once upon. What an honour to have a song recorded by such professionals. Pixie Hat on Sure Where Would You Get It?